I was kinda disappointed with the roachlings in heart of the swarm. Drew what I expected them to look like: Idk, modeling challenge maybe. Might model it myself sometime later. @phanalax128: Go The Roachling isn't supposed to be related to Zerglings, it is a smaller and faster Roach. But I agree it was cheap to simply resize the model. Considering the mitoscarabs you got the tech from were just downsized chief roach models, I would not complain. 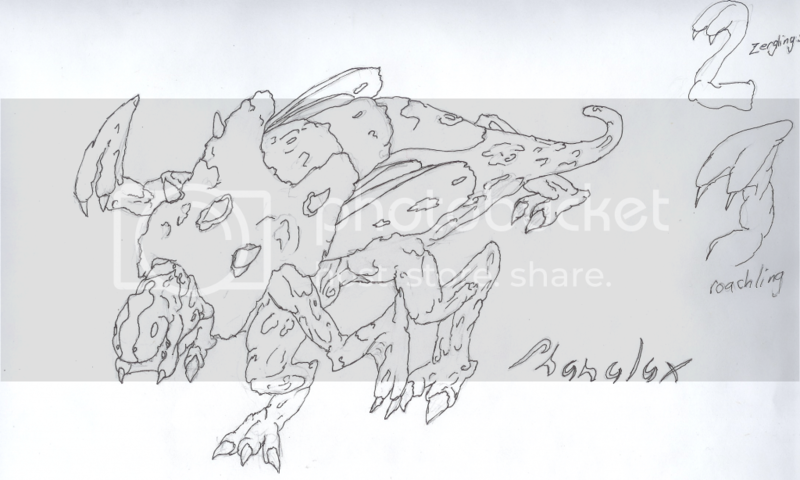 Your idea of roachlings looks like it'd be a good ... hybridization ... of the two Zerg ground breeds. I like it! Lacks the three eyes of the roach. The malformed wings is a good tough but I would add something to the tail and maybe extend the front part of the claws for a more scythe like look. Looks cool. Doesn't look too roachlike though, more like a zergling with armour plates... which is roachlike. How many legs is it suppose to have? I'm counting 5 in the image. I'm guessing 6? Assistant Team Leader of "Generic Code" and User of the All-Mighty Data Editor. Try Mercs of the Dark System, a RTS/MOBA hybrid. 4 legs, your probably mistaking the claws for legs. I know there is a lack of contrast. Really the only changes I atually made where to put a plate on its back, make its mouth more like the roaches, and change the claws slightly.